There’s a gadget that sits on my desk every day. Well, there are probably at least a dozen gadgets, but this particular one might surprise you. The biggest problem I face is keeping my creativity running at as high a level as possible, almost constantly. My job, and maybe yours too, requires that I’m squeezing as much juice from my imagination and wherever the artistry comes from, every minute of the day. Sleep, exercise, fresh air, and sufficient energy from food are all essential fuels for that kind of high mental and emotional burn-rate. But they’re not enough. I still need little tricks, and rituals. Enter my weird gadget. Pretty much anything you’ll find on my desk can be used to commit ideas to some kind of semi-permanent form. There’s a MacBook Air there, and a huge iMac. There’s a paper notebook, and more than fifty writing implements (and another twenty or more notebooks in the filing cabinet nearby). Witness my two different kinds of post-it notes: regular, and speech-balloon shaped. There’s a keyboard, and a Wacom tablet, and a drawer full of peripherals, adapters, cables and gizmos. You can take your pick. I’d advise picking this thing instead. Pick it up, and walk away with it. Get some distance from the desk, and the creativity-dulling stasis field that Places Of Work emit. Let’s take a look. This little toy doesn’t weigh very much, does it? Open your hand, and there it is. It’s old school, I know. A dictaphone, in the flesh - or rather a “digital voice recorder” or DVR, as we’re supposed to call the ones that don’t use a cassette tape. I think that dictaphone sounds better, so we’ll go with that. This is the finest brainstorming, writer’s-block-busting, idea-generating, brain-freeing chunk of cheap electronics you can buy. I love this thing. It’s one of the great secrets of getting to the next page. But dedicated devices are invariably better than their simulated, touch-screen equivalents. A piece of hardware that’s designed for the task, without notifications, or general-purpose controls, or on-screen buttons you can’t feel. What you need is a dumb chunk of plastic whose entire world is doing that one thing you want. In this case, it’s recording my voice. Let me tell you a little bit about this thing. It’s a Sony ICD-PX312 (which has now been superseded by this better model). It has an unusual combination of features for the price. It has 2 GB of internal memory (that’s over 20 hours of audio at the default highest quality), but also takes microSD cards or Sony’s own M2 sticks. It takes ordinary 2xAAA batteries (included), or can be powered via USB. The connector is standard micro-USB. You can connect it to your computer via that same USB cable too, and it just mounts as regular Mass Storage, with no software required (handily, you’ll find the instruction manual on there as a PDF, in several languages). The recordings are MP3s, with a bit-rate you choose. It has a headphone port, and another port for an external microphone - which the device can power. Sound quality is good, and the built-in mic can comfortably deal with anything from you holding it in front of your face, to a whole meeting-room of people (it has different modes for those situations). It’s about the same length as an iPhone 4/4S, 60% of the width, twice as thick, and very light. It’s also cheap as chips, and pretty solid. You may drop it with impunity. Most importantly of all, I can use this thing with my eyes closed - or while gesticulating to the heavens with my other hand. The button labels are as big and bright as practicable, and there are many tactile affordances, like a recessed Record button with a thumb-groove, and a dimpled, protruding Play/Enter button. This whole device has been designed to get out of your way, and let you just chatter. You can use it for… whatever it is that you do. What the hell happens next in this scene? Why does that bug only show itself when there’s no internet connection? What should I get my true love for Valentine’s Day? What was I saying, again? Ah yes, the dictaphone. I use it to note down ideas for settings, scenes, and entire articles or stories. I use it for snippets of dialogue, or even just cool phrases or fragments that occur to me. Sometimes I try to do some of them in either Captain Kirk’s or Captain Picard’s voice, with mixed success. I’ve had at least a couple of really good ones. My usual technique is to pause and resume recording frequently, to avoid feeling pressured by knowing that the ‘tape’ is rolling. I think you can set it to automatically pause and resume recording depending on whether you’re talking, but I like pressing the buttons. Most usefully of all, I ask myself questions about a writing problem I’m having, then attempt to answer them. My brain seems to react to a direct, spoken-aloud question with some urgency, throwing out ideas that were beyond reach when I was considering the problem in the abstract. I’d recommend you try that trick too. Yes, it’s one more thing to carry around - and that’s anathema in this age of convergence. What we’re supposed to do is cheer when our hungry little black mirrors swallow another piece of consumer electronics whole, digitise it, and trap it forever behind glass as a collection of ever-smaller pixels. It’s all vaguely sinister. But we’ve lost something; we’ve paid a price for the convenience and portability of these everything-boxes. I think the cost has been focus, and clarity. If I’ve learned one thing above all else during the past year, it’s that screens are a prison for creativity. I just can’t think there. Can you, really? Don’t you have your epiphanies about that software bug once you’re halfway to the bathroom, or lying in bed staring at the ceiling? Doesn’t the perfect design occur to you while you’re buying a sandwich, or reversing out of a parking space? Doesn’t the inspiration come when you’re out under the sky, trying to get some space away from those endless rows of shining little reds, greens and blues? I think we’re probably on the same page. I have the dictaphone for the same reason that I have a quality notebook and pen at hand. For the same reason that I have the best writer’s laptop you can buy. Because nothing is more valuable than your time, nothing is more important than maintaining your creativity, and nothing is better than a dedicated tool that understands those things. These other gadgets on the desk will disappear over time. Some will be replaced with newer, ever sleeker models. Thinner phone, faster laptop. Maybe the keyboard will be a hologram, or some damned thing. The very thought of it is tiring. 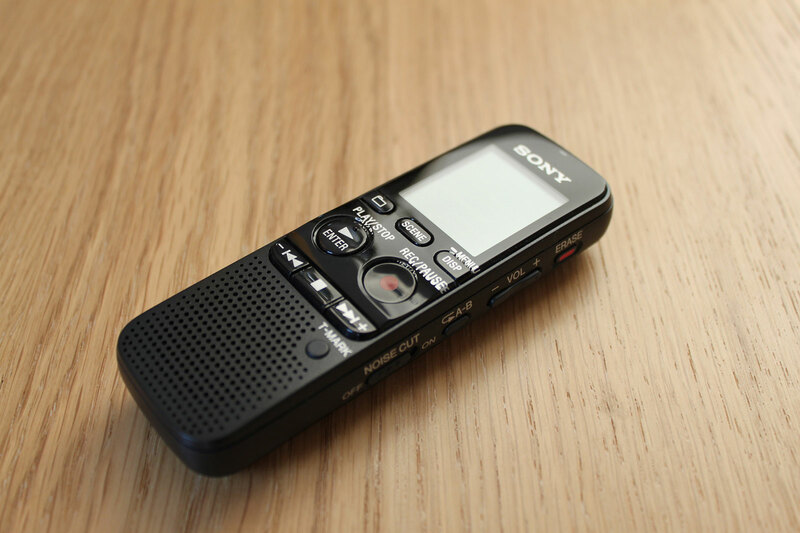 The dictaphone, though, has outlived about three generations of these wonder machines so far, and it’s still going strong. I have a feeling it’s going to be around for a while.